It was an incredible experiment — a bold journey into undiscovered territory — both for the kids and for their director. The concept was simple enough: to find the brightest, most musical, most committed young musicians in Thailand, and to plunge them into total immersion. 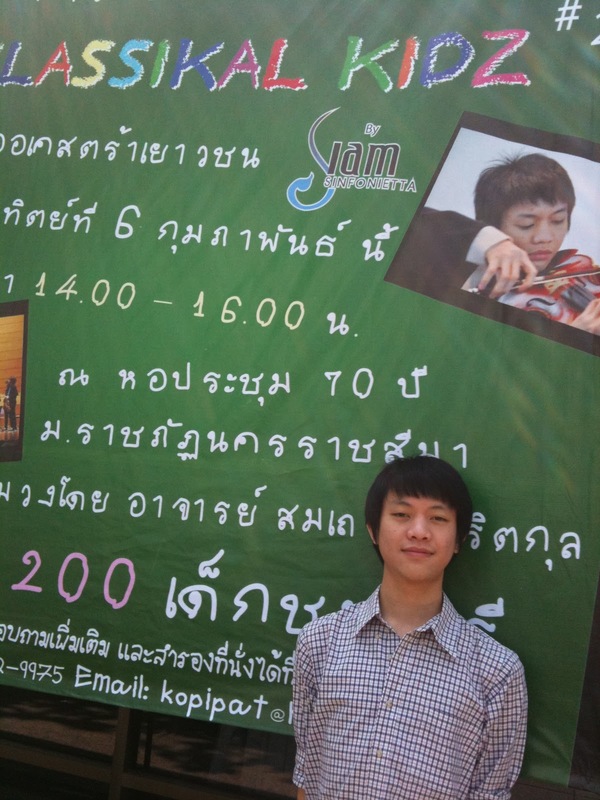 The Sinfonietta kids were going to be fed to saturation on the classical style, a style which had not, up to now, been systematically taught in Thailand’s music schools. They were not going to learn a movement here and a movement there, but were going to absorb entire repertories, and they were going to be asked to play in a radically new way — surrendering themselves completely to the passion, the drama, and the precisely articulated textures of the classical period. It was tough. There were casualties — a few very fine young musicians couldn’t take the heat and retreated to youth groups with a more easy-going schedule. There was also harsh criticism. But the ones who have been with us for this exciting first year of Si Si’s history have become a closely-knit family. They know that they will be playing together for the rest of their lives. Their grasp of the classical style has become instinct, the drama second nature. The Sinfonietta spent time on the road this year, playing twice in Korat and twice more in Hua Hin. Members of the group played Bach in the market in Korat, an exremely moving event as it may well have been the first time this music was ever heard live in that location. They also played a wonderful concert to help raise money for the city of Bangkok after its recent troubles, the Together We Can concert ... and many events for kids, many of whom had never heard classical music before. And in a little while, the reality show and the line of CDs is going to be launched. The sky is the limit for these remarkable young people. 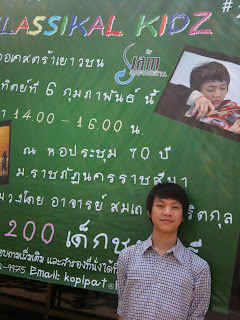 วิลลี่ cello : ของคุณอ.สมเถาที่ทำให้พวกเราทุกคนมาเจอกัน ขอบคุณอ.ที่ทำให้อนาคตของพวกเรามาได้ถึงขนาดนี้ ไม่ว่าผมจะไปอยู่ที่ไหนก็ตาม ไม่ว่าผมจะไปได้ไกลขนาดไหน ผมจะไม่มีวันลืมบุญคุณของอ. โอม cello : หนึ่งปีที่ผ่านมามันเยอะมาก มากไม่รู้จะเขียนลงไปยังไงดี =_=" รู้แต่ว่ามีความสุขมากๆ ที่อยู่วงนี้ ทุกครั้งที่ซ้อม ทุกครั้งที่ได้่เล่นดนตรีกับน้องๆพี่ๆเพื่อนๆ...จนแทบลืมไปเลยว่าแก่ขนาดไหน แล้ว 555+"